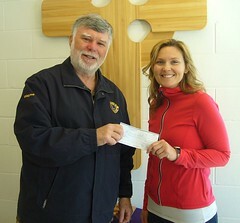 Westport Lions President Wayne Bent presents a cheque to Special Education teacher Nicole Gardhouse. The money will be used for St. Edward School’s music program. 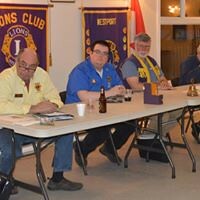 The Westport Lions are excited to be able to help bring music to St. Edward School. The arts are often underfunded in today’s educational climate due to the emphasis on math and languages. St. Edward’s principal, Dan Lesser, believes the Arts are important and has decided to focus more on music this year. 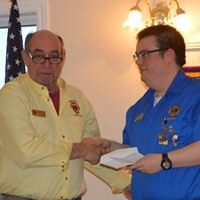 To achieve this goal, he has ordered 23 ukuleles with funds donated by the Westport Lions Club and the local Legion. Some parents came up with the novel idea of donating money towards purchasing instruments in lieu of teacher gifts at Christmas. All students presently get a basic music education but with the additional funds it will allow the school to give the students more experiences in music. Students from kindergarten to grade two will learn music from boomwhackers and diatonic desktop bells. A quick Wikipedia search explains that a “boomwhacker is a lightweight, hollow, colour-coded, plastic tube, tuned to a musical pitch by length. Boomwhackers are used as musical instruments in the percussion family.” You can see students happily playing boomwhackers on You Tube with amazing results. Diatonic desktop bells are C-to-C range desk bells that use the same colour notation as boomwhakers musical tubes. With one type of the bells, you push the handle top and it’s a desk bell. Pick it up and swing it, it’s a hand bell. Students from grades three to eight will learn music from playing the ukuleles. The school hopes to organize a small morning concert in June after the students are finished with their music lessons for the year. I am sure it will be a very enjoyable experience for all that are involved. 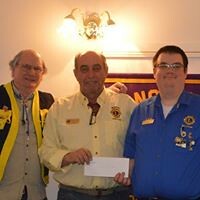 Principal Lesser expressed appreciation to the Perth Chapter of the Canadian Federation of University Women, parents, the Legion and the Westport Lions Club for their generous donations that enabled them to start this program.